I gave up on instant/quick cooking oats a long time ago. Such industrial packets of reconstituted mush are certainly not to my taste. So I gave it a go with the double boiler and was much surprised with the result. A double boiler keeps an even temperature which eliminates scorching on the bottom so you need not stir the oats while they are cooking. This in turn helps the oats maintain consistency rather than being broken and damaged by stirring. It's a win-win situation and I a fervent convert to this method of preparing oats. The ad itself is selling a Kerosene stove. Perfection stove company teamed up with the Aladdin Lamp Co. to manufacture a stove that cooked like gas but used Kerosene. 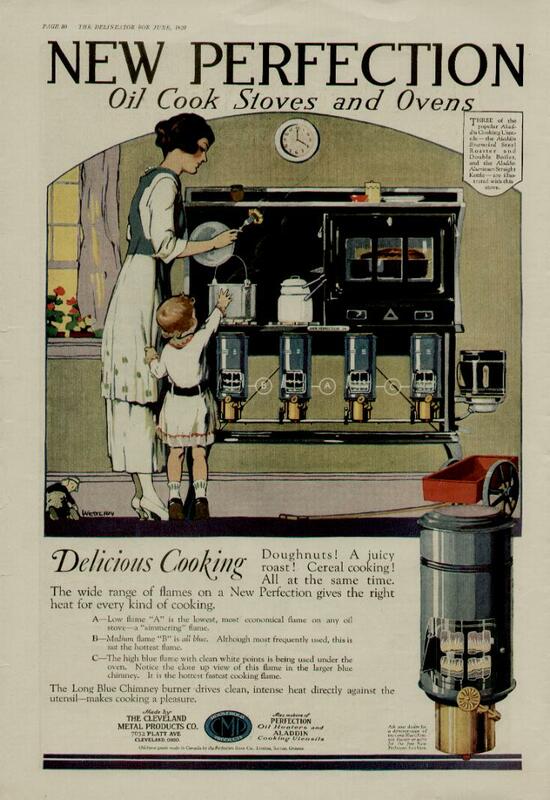 They were all the rage in the 1920's selling several hundred thousand stoves before the crash in '29. They were especially popular in the South as they produced considerably less heat than a wood/coal cook stove. Perfection is still around although it is a shadow of it's former self having been driven out of the market by the proliferation of electric stoves, however many Perfection stoves are still around today quietly collecting dust in forgotten corners or better yet still in use in areas where electricity is not practicable. I've been on the hunt for an antique perfection stove for years, especially one like that depicted in the ad with the oven, which was an optional feature and was removable. The oven sat over two of the burners. Perhaps someday I will find a perfection stove to call my own.